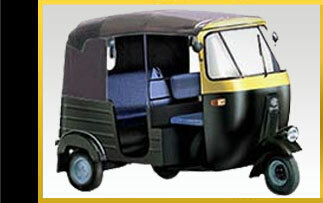 Three Wheelers are largely used as commercial vehicles, used to carry passengers and goods. They have bi-fuel engine, working either on CNG or LPG and petrol for limphome. They have TMC brake system and anti-dive front suspension. They are provided with remote location gas filling and oil pumps drive extracted from clutch shaft. It is safe on road and low on maintenance and highly economical. They are also cleaner for the environment and convenient. 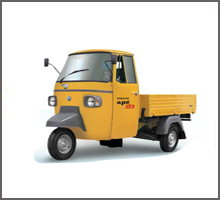 There is an efficient battery charging also provided along with safety measures in case of brake failure. They have got good after sales service. Because of the bifuel mode, one can run the vehicle in a number of ways, thereby making maintenance convenient. 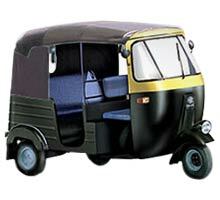 Bajaj three wheelers, Piaggio van are some of the brands who make vehicles in this category. Easy indication of petrol/gas mode, high beam, neutral gear & battery charging. Enables the vehicle to reach the gas filling pump in the event of vehicle running out of gas. Shock Absorbers Front - Hydraulic, double acting, Rear â Hydraulic, double acting. Fuel tank Capacity Full â 8.0 ltrs, Reserve â 1.4 ltrs. Gradeability 16 % (9.1Â°) max. These are the latest vans from Piaggio. They are ideal for carrying medium weighted goods. The covered top keeps the goods protected from harsh weather. 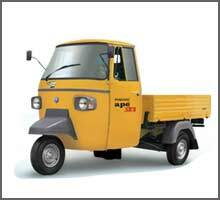 Piaggio Ape City powered by the 4 stroke, naturally aspirated engine with 395cc engine displacement. It can makes 5.52 KW @ 3600 rpm power and 16.7nm @ 2400-2200rpm torque on ride. The engine features Wet multi disc type clutch. The quality vehicle have 20% Gradeability & 165mm clearance. The engine mated with 4 speed manual gears transmission. 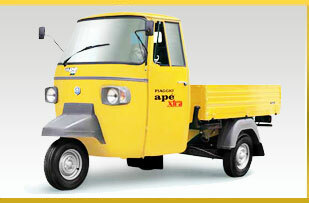 The Piaggio Ape City have Driver +3 passengers seating capacity. 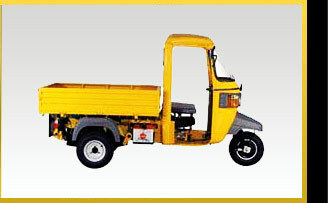 For safety equipped with Hydraulic telescopic front suspension and Mechanical a" hand operated brakes. 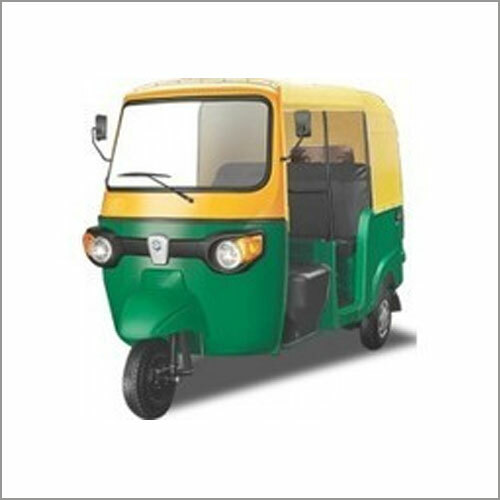 The vehicle uses Handle bar type steering also.